I've decided that this evening should be about the music that shaped my late teens. It was the time I was discovering metalcore/melodic death metal bands like Killswitch Engage and Dark Tranquillity, as well as many more. Those bands still play a big part in my life and I've always been up for discovering new bands that are following in their footsteps. 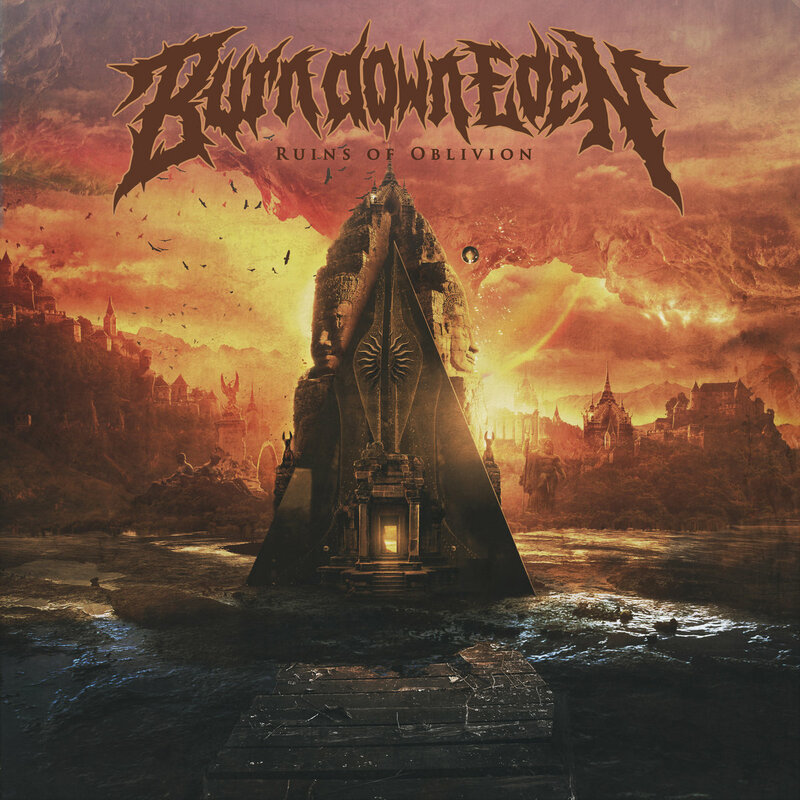 Dresden's Burn Down Eden is the band of choice then and their 2016 full-length "Ruins Of Oblivion", which has been release on both cd and vinyl via Sliptrick Records and 7hard Records respectively. They released their first EP "Memoirs Of Human Error" in 2015 and have appeared at the warm-up show for With Full Force festival earlier this year. Burn Down Eden don’t pull any punches with their furious death metal. Serpent’s Deception is frenetic from the off. The drums never slow down, the bass keeps the rhythm section beefy while the duelling guitars provide loads of melody and harmonies. The vocals are a mix of deep bellows and higher-pitched rasps that suit the music well. I wasn’t expecting a start like that! The band does seem to favour the lead work on “Ruins Of Oblivion” and that is evident in the production, which is clear and clean. That doesn’t affect Omnivorous though, which is filled with both technicality and powerful blasts. They were spot on when they named Whirlwind Purification, as it goes by in a tornado of catchy and succinct melo-death. I actually think that using the term melodic death metal as a description for Burn Down Eden’s music is a bit of a disservice, as there’s a great deal of heaviness to it. Just listen to Kronosphere if you’re not convinced! There’s something comforting about this record. It’s not pretentious and Burn Down Eden aren’t trying too hard to be something they’re not. They just thrash like their lives depend on it on Artificial Exitus. There are hints of Trivium before they did away with the jaw-dropping metal of “Ascendency” (still my favourite album by the band). Artificial Exitus is the standout so far for me. They’re a bit more straight-down-the-wire on Sons Of Isengrim, but the solo puts pay to that with a nice semi-improv feel and old-school tone. Talking of old-school, Pandemonic Overture takes Burn Down Eden further back towards their heroes and reminds you that no matter how modern a band may be in sound and production values, they still have the same bloodline. Pandemonic Overture is one of the heaviest songs on “Ruins Of Oblivion” and it’s charm is undeniable. People spend too much time in their own bubble, just listening to the same bands they grew up with. These guys prove that venturing into unknown and indeed underground territory is more fun, in musical terms at least. I, Dooms Visage isn’t the slow, meandering song you might have expected. Instead, it retains the band’s excellent song-writing. They find time to add in a little instrumental interlude called Nebula as the penultimate track. This may have been done many times before but it’s still a welcome change of direction, albeit for a brief moment as it fades straight into album closer Cosmogyral Miscarriage. It sounds like a gore-grind/brutal death metal song title and it has the tempo to be either, but Burn Down Eden has other ideas. They use it as an excuse to fill your ears with one final slab of expertly performed death metal. The musicality and precision on show here is that of a band well beyond their years. It’s hard to write an infectious record in a climate with so much musical competition but Burn Down Eden manages just that. You won’t regret taking a chance on this.